Tucked back to one side off the well beaten path of the Post Road in Milford, roughly a hundred red heads lie on their sides in elevated cubbie holes. Hardly anyone paid them attention. In fact, I may be the only one who even noticed. A double stacked row, maybe 25 gallons of Maker's Mark bourbon - original wax seals unbroken - is just for decoration. My eyes roamed elsewhere, and caught George Harrison sprinting away from a Blue Meanie. I shook my head and returned my attention to the chicken and waffles. This past October, thieves (likely insiders) made away with approximately $26,000 worth of Pappy Van Winkle 20 year old bourbon. Each bottle in the 65 cases stolen is worth roughly $130, but many sell for hundreds of dollars more. Pappy had a small cult following of aficionados until rock star chefs like Anthony Bourdain and David Chang blew up its spot in the past few years. Ever since, the small supply that leaves Frankfort, Kentucky each year has been dwarfed by the demand. Drew Kulsveen, a minor royal in the bourbon world and friend to CTBites, could barely get one bottle. On a weeknight at Plan B Burger Bar, we were about to be presented with two servings. Plan B partnered with Buffalo Trace to conduct The Magical History Tour, allowing its chefs to stretch their muscles and create multi-course dinners on a bourbon theme with not a burger in sight. Pappy Van Winkle is produced under the aegis of Buffalo Trace, and several bottles of it make their way to each History Tour dinner, along with other brands like Blanton's and Eagle Rare, to pair with the food. John Brennan, head chef at Plan B in Milford, had created a seven course dinner for the assembled guests. He would introduce each dish, and Heather Reidl, the representative from the Sazerac Company, which has owned Buffalo Trace since the early 1990s, explained the history of each bourbon as it was served.Yellow Submarine was showing soundlessly on a far wall, and music by The Beatles played softly, making a much prettier scene than the three car accident I'd crawled past on I-95. I walked in just as the first dish was being taken away. I knocked back a lonely finger of Buffalo Trace left from the first course and settled in. 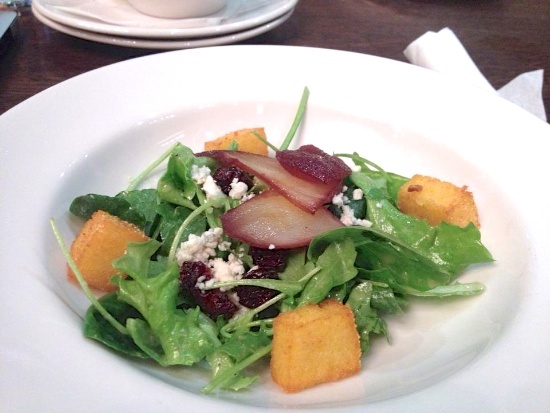 A salad of arugula and baby kale with dried cherries, bleu cheese and polenta croutons, tossed in a bourbon vinaigrette with rough cut bacon was placed before us. The dish's sidecar would be Elmer T. Lee bourbon, named for a former master distiller at the progenitor George T. Stagg Distillery. The salad itself was pleasant, but Brennan did a beautiful job putting a crusty glaze on the chunks of bacon. The smoke in the meat paired well with the caramel notes in the bourbon, which sliced through the oils in the dressing and cheese with sharp alcoholic bite. 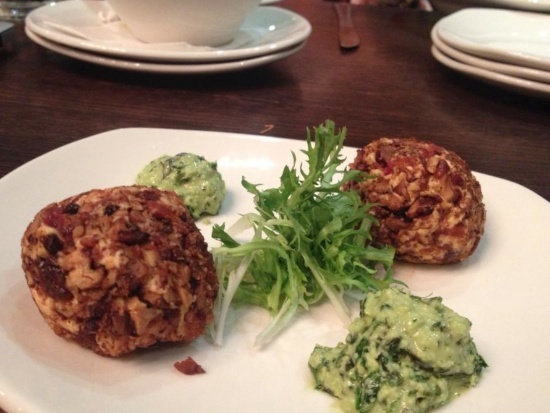 The staff at the back of the house had smoked a blend of cheeses, rolled them in crushed bourbon candied pecans, and served them with toast and a roasted apple and basil pesto. The accompaniment of Eagle Rare bourbon was a match for the cheese balls, which make a good hors d'oeuvres, spread on a toasted baguette. The cheese had a pleasant snap of capsaicin heat to go along with the crunchy coating. The pesto smoothed over some of this heat, but it was much too sweet for my tastes. Another slug of whiskey took care of that. Blanton's was launched in 1984 as Elmer T. Lee's tribute to a master distiller before him, and was the country's first modern bourbon sold as a single barrel select. Each barrel is still hand "dumped" to this day. Applewood smoked pork belly glazed with bourbon maple syrup was the pairing, sharing plate space with a drizzle of Thai chili sauce, and a roasted apple stuffed with micro greens. The pork belly was attractively browned, both top and bottom, and easily cut with a fork - the skin was reduced to an almost unholy delicious chip. That much fat, even pork fat, can be overwhelming, but the chili sauce was a scalpel that cut through the blanketing lipids. The roasted apple was served skinless, which is not my preference, but its sweetness mixed well with the bitter greens and piquant belly. Pork, bourbon, pork, bourbon - it threatened to get a bit dull, but the mix of flavors on this plate was certainly enough to hold one's attention, and I liked everything quite a bit. Blanton's is light in color and easy on the nose. The smoke in this whiskey is slightly subdued, but a heavy dose of tannins rears up as soon as the prickly heat from the alcohol dissipates. That said, it actually runs a bit cooler than the previous Eagle Rare, served with the cheese balls, despite Blanton's higher proof. The legacy of Colonel Edmund Haynes Taylor looms large in bourbon history, and it was he who gave the current Buffalo Trace Distillery its first name. He purchased the operation in 1870 and named it the Old Fire Copper Distillery. E.H. Taylor Small Batch was the next whiskey held in our greedy hands, every drop having been aged for seven years on the highest floor of the semi-climate controlled warehouse he had built in 1881 - the first one of its kind. Taylor was also instrumental in the passage of the Bottled-In-Bond Act of 1897. The act states that bonded whiskeys must be the product of one distillation season at one distillery, aged for at least four years, and bottled at 100 proof - right where this small batch clocks in. This was probably my second favorite drink of the night, and presented a very supple character with attractive warmth, and toasty, delicious caramel. The fifth course was chef Brennan's take on chicken and waffles, a dish which has lately become so popular with the Yankee crowd. The chicken thigh confit on my plate had been roasted, hickory smoked with a bourbon sarsaparilla glaze, and sat atop buttermilk Belgian waffles with bourbon vanilla butter. The chicken's skin color alone told you this was going to be good, but juices and meat alike exploded from under the glazed shell the moment it was pierced with a fork. The smoke was central the flavor, but the skin was sweet, slightly crunchy, and slightly chewy - almost like a pork cracklin. The waffles were very lightly done - sweeter, rather than caramelized - and taken to the next level when spread with the ball of vanilla butter. The savory chicken juices soaked down into the waffles, mixed with the other flavors, and became something more than its constituent parts. I may not be educated enough to know why this works, but let me suffice it to say that it just does. Seared scallops wrapped in house cured country ham under bourbon pomegranate molasses with smoked grapefruit segments and over frisee was very tasty, but I practically disregarded the dish. (Sorry, chef.) The fact was, it was time for our first dose of Pappy. I had only seen it on a screen, and now I had a solid dram of Pappy Van Winkle Family Reserve 10 year old bourbon, right in front of me. I was enraptured. The whiskey was just a medium amber, and had almost no legs when swirled. I brought the glass closer, and there appeared to be a grain fed furnace burning under my nose. There was immediate heat and spice as soon as the first sip hit my tongue, and strong tannins followed. I continued sipping and thought about how to describe it further for you, how to bring this together in both my mind and yours. This is what I came up with: "a burly whiskey with gentle hands." The final course for the night was a bourbon banana pudding with house made vanilla wafers, bourbon whipped cream, and abrûléed banana standing proud of the whole thing. 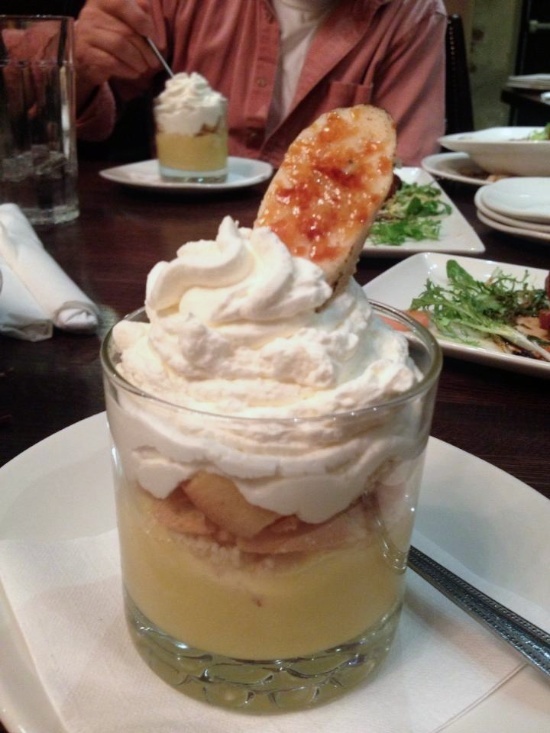 I'll admit I'm a sucker for banana pudding, but I absolutely adored this one. The fresh wafers were a nice touch, but the crunchy, caramelized exterior of the banana itself, especially when mashed in with all the other flavors, was both the literal and figurative high point of the dish. That's not why you're still reading at this point, though, is it? 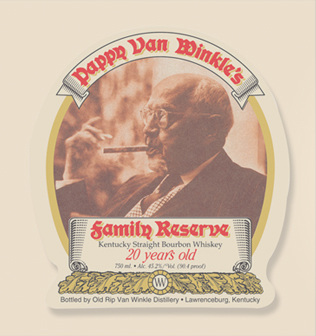 The Pappy Van Winkle Family Reserve 12 year was, if you'll permit some low vernacular: mega-toasty. Thin legs crawled down the glass, and there was again that pervasive caramel nose, but this vintage was half again as hot as the 10 year old. Pappy, like most of the other brands Buffalo Trace makes, is a bourbon with a lot of wheat in the mash bill. Wheated whiskeys tend to burn exceptionally hot on the tongue. The batch and the weather during the time involved may have changed things, but the two extra years of rest in those oak barrels, made a country mile of difference compared to the merely decade-old Pappy. Both the 12 year old and the 10 year are 107 proof, but this was a much more mellow sipper. My personal preference, at least on this night, was the 10 year - I just loved that bite.